One bright, warm day last early June, I hurriedly made the rounds at the farm. As I walked toward the tool shed I heard a steady hum, not unlike that of a car engine as it passed by on the street. Such a sound would usually go unnoticed, except that the hum never dissipated, rather it seemed to originate from all directions and held within its tone a sharp vibrational buzz. I looked up and beheld a sky saturated with a flurry of tiny dark flying bodies, swirling into a zip-zagging cloud, as though I were suddenly inside a freshly shaken snow globe filled with black beads. Then the cloud began to increase in density and decrease in size, as though the beads were caught in a centralized magnetic field, which focused the hum to a frenetically piercing decibel. As I stood stunned, the cloud condensed to the size of a beach ball and began to ascend like a helium balloon suddenly released, drifting up and into the branches of our mulberry tree. I had to shuffle under the tree to keep sight of the cloud, craning my neck and squinting as the dappled sunlight struck high-contrast through the thick leaves. The cloud slowed and affixed itself onto the very top branch and there it morphed into an undulating mass. The mass became molten, churning but never dripping free, instead resisting gravity and reforming towards its pulsating center. What I had witnessed was the natural phenomenon known as a bee swarm. 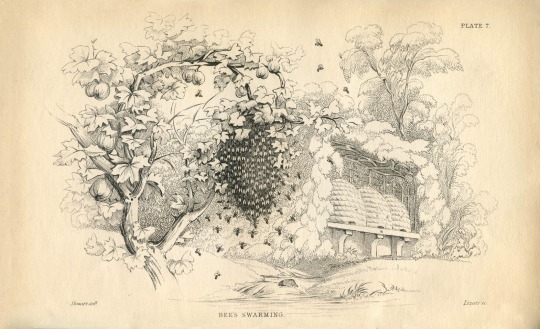 Not uncommon and yet an exceptional event in career of any beekeeper, swarms happen most often in the springtime when the population of bees inside the hive can rise rapidly enough to trigger an escape plan within the instinctual mind of the queen. Once her plan is issued, worker bees construct new queen cells (also called swarm cells) to raise replacement royalty for their colony. Then, on the next available warm day, the original queen embarks on a brave journey out of the hive, flying with feeble wings that have likely never been air-born. Approximately 10,000 bees from her colony (roughly 1/3 of the total hive population) loyally follow their mother and fearless leader out of the only shelter they’ve known in search of a new home. For the adventurous swarm there is no guarantee of security, no promise of stability. There is only the will to move. In an urban situation such as mine, a bee swarm is often seen as a menace to well-intended city dwellers who, out of sheer ignorance and fear, destroy it with lethal spray or in the case of one shocking online video, douse it with lighter fluid and ignite it into a brief but terrible inferno. It’s my opinion that if the phenomenon were commonly referred to as something less frightening, it might have a better chance at surviving encounters with humans. Bee refugees, perhaps? At any rate, if the swarm manages to avoid an unnecessary attack, it will affix itself to the nearest structure (a tree branch in this case) and remain there for a day or so while scout bees survey the area for miles. If the scouts locate a suitable domicile (a hollow log, or an airspace below a pile of lumber), they will relay coordinates to the swarm and relocate en masse. If a beekeeper reacts quickly enough, she can capture it before the relocation commences and voilà: bonus hive. Having never captured a swarm myself, I decided to call on the assistance of my friend and local apiarist extraordinaire Jana Kinsman, who just happened to be sitting in a dentists’ chair just a few minutes from our farm when I sent my distress call. Jana arrived on her bike (her company is called Bike-a-bee, after all) and confidently scaled a 25 foot extension latter to dramatically capture the swarm into a plastic bucket. I then prepared an empty hive, into which Jana deftly dumped all 10,000 bees with a dramatic WHOOSH. I made a short video that documents all of the action. What astounds me most as I watch the video for the umpteenth time, is how docile the bees are during the entire operation. Since they have no home to protect, and therefore no honey or brood (baby bees), they are utterly harmless and can be handled without gloves or even a bonnet. It is mesmerizing to watch a bare hand scoop softball-sized clumps of bees as though they were aqueous. As you can see in the video, I reached out my own hand to pat a surface of worker bees as if they were small puppies, and at that moment my own notions of danger and fear fell away like thin veils. Those veils are the armor that we wear every day. The armor is cracker-thin and shatters easily and yet we have painstakingly constructed it in such a way as to make it very difficult to untie. As babies we require no armor because we are protected and nurtured by our parents, in the “cradle of loving-kindness”, as Pema Chödrön puts it in her book The Wisdom of No Escape. When you leave the cradle of loving-kindness, you are in this beautiful suit of armor because, in some sense, you’re well protected and you feel safe. Then you go through puberty rites, the process of taking off the armor that you might have had the illusion was protecting you from something, only to find that actually it’s shielding you from being fully alive and fully awake. There are many times throughout our lives when we leave one cradle after another. After I graduated from college with a useless art degree, I floundered Benjamin Braddock-style for a summer and then decided to pack up everything that I owned into a rental truck and relocate to Chicago – a city that I had never even seen before. My armor was cobbled together for the journey and worked fairly well. I met someone with compatible armor, got married, and for several years kept my sheilds intact. And then one day, a chink in the armor was revealed and the whole racket collapsed, sending me plummeting to the darkest place I had ever been. I felt very sorry for myself for some time until one day, a friend told me that I was lucky. Lucky to be in a place when all of my cells are ready to be re-constituted into something new. Finding myself in the darkest depths was an invitation to become fully alive. …the beauty of helping bees this way, for me, is that every one of us needs to behave a little bit more like a bee society, an insect society, where each of our individual actions can contribute to a grand solution, an emergent property, that’s much greater than the mere sum of our individual actions. Tagged bees, buddha, honey bees, marla spivak, pema chodron, swarm. You are an awesome writer. I totally enjoyed your essays. Look forward to reading many more .